Over the years, the Red Sox have had players on their roster who were perhaps better known for the uniqueness of their name than for anything they did on the playing field. You may recall Jennings Poindexter, Carmen Fanzone, Creighton Gubanich, Gar Finnvold, Izzy Alcantara, Win Remmerswaal, Osee Schrecongost, Hippolito Pichardo, and Arquimedez Pozo, to name a few. You could add La Schelle Tarver to that list. 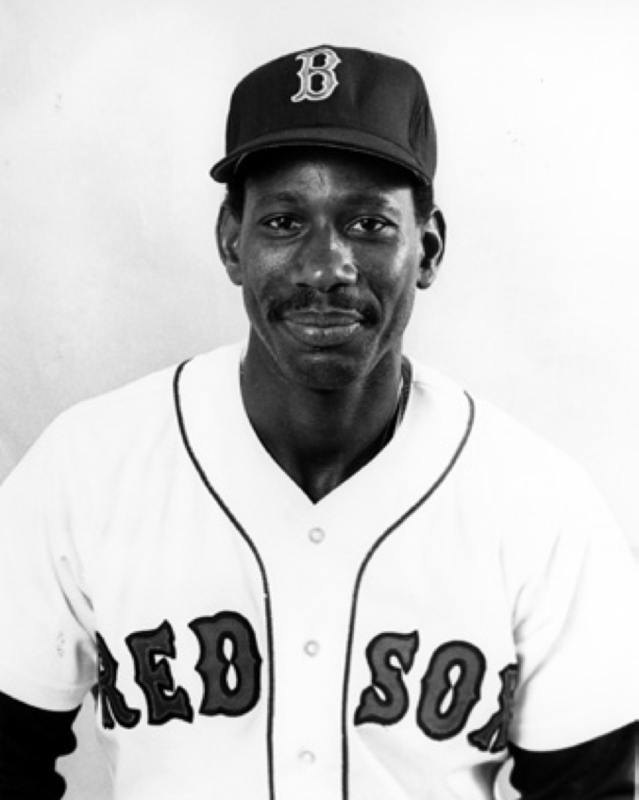 In a one-season major-league career that lasted only 13 games, Tarver was a .120 hitter (3-for-25), scoring three runs and driving in one during the summer of 1986 for the Red Sox. He did not produce an extrabase hit or steal a base although it was for his speed in the outfield and on the base paths that he was initially valued. Tarver simply came on the scene at the wrong time–the Red Sox had proven veterans starting in their outfield that season. Future Hall of Famer Jim Rice patrolled left field, Golden Glover Dwight Evans was in right, and former American League Player of the Year (The Sporting News, 1981) Tony Armas was their center fielder. In addition, Kevin Romine and Steve Lyons saw a good deal of reserve play that year before a late-season blockbuster deal brought playoff hero Dave Henderson on the scene. La Schelle Tarver was born on January 30, 1959 in Modesto, California, the son of James Tarver and Mary L. Jackson. While he never met his father, he was the fourth of six sons born to his mother, who was a nurse. He noted that he was the baby of the family for 11 years before his two younger brothers, Rodney and Ken Jackson, were born. His older brothers were Paul, Anthony, and Tyrone Brice. Shortly after La Schelle was born, the family moved to Madera, California, where he grew up. Born with a weak heart, Tarver was not allowed to play any organized sports when he was real young, but by the time he was 10 years old his mother acquiesced. He was allowed to sign up for Little League baseball in 1968, but showed up for practice without a baseball glove. When he was 13, the varsity coach at Madera High School, Stan Bledsoe, coached the Babe Ruth all-star team. Tarver was later named the most valuable player of the all-star tournament. The 5-foot-11, 165-pound outfielder, who batted and threw left-handed, was a Northern California All-American first baseman when he played at Madera High School. He was scouted by Fibber Harioma of the California Angels and after his 1977 high-school graduation was drafted by the Angels in the 42nd round of the major leagues’ amateur draft. He opted instead to attend college. Tarver played two years for Reedley (California) Junior College in 1978-79, then moved on to Cal State University-Sacramento in 1980. Cal State had produced several other major leaguers including infielder Mike Fischlin and pitcher Keith Brown. After spending the summer of 1980 playing for the Humboldt Crabs in the Humboldt County baseball league for college players, Tarver was drafted by the New York Mets on August 18, 1980. He spent 1981 through 1985 in the Mets’ minor-league system, where he hit .313 with 2 home runs, 174 RBIs, and 217 stolen bases in 599 games. After a spring-training injury in 1981, Tarver spent his first minor-league season with the Shelby Mets of the South Atlantic League. The team also featured future major leaguers Lenny Dykstra, John Gibbons, Randy Milligan, and DeWayne Vaughn. Tarver was the team MVP, leading Shelby in stolen bases with 57 while batting .314 and driving in 27 runs. He also played five games with the Lynchburg (Virginia) Mets of the Carolina League. Tarver started the 1982 season with Lynchburg, where he was the one of the team’s regular outfielders along with Herm Winningham and Milligan. Tarver hit .308 and stole 56 bases. He wound up the season with Double-A Jacksonville and Triple-A Tidewater. Tarver made the jump full-time to the Double-A Jacksonville (Mississippi) Mets of the Texas League in 1983, joining an outfield that included Beane, Winningham, and John Christensen. There he batted .316 with 36 RBIs. At the end of the season he played in three games for Triple-A Tidewater Tides, managed by future Mets skipper Davey Johnson. That team featured several Mets players who would comprise the 1986 World Series championship team, including Wally Backman, Darryl Strawberry, Rick Anderson, and Ron Darling. For the next two seasons, Tarver continued with Tidewater, batting .326 with 36 stolen bases in 1984 and.311 with 35 stolen bases in 1985. On November 13, 1985, the Mets sent Tarver, outfielder John Christensen, and pitchers Wes Gardner and Calvin Schiraldi to the Red Sox in exchange for pitchers Tom McCarthy, Bob Ojeda, and minor leaguers John Mitchell and Chris Bayer. Tarver looked it as an opportunity to perhaps play for a team that didn’t put a lot of emphasis on speed, which had long been his calling card. With Mike Stenhouse and Mike Greenwell on first and second, respectively, with singles, Tarver pinch-hit for Mike Easler. His liner was caught by shortstop Doug Baker, who stepped on second to put Stenhouse out and threw out Greenwell before he could retreat to first. Tarver began the 1986 season with Triple-A Pawtucket, spending time in the outfield with Boston prospects Mike Greenwell and Todd Benzinger. At the time, Tarver was leading the International League in batting with a .359 average. He was in the midst of a stretch where he had hit in 16 of his last 17 games, going 31-for-70 (.443). He was also tops on the team in stolen bases with 20, despite having missed the first three weeks of the season with a groin pull. When center fielder Tony Armas pulled a thigh muscle and went on the 15-day disabled list in mid-July, the Red Sox purchased Tarver’s contract from Pawtucket. He became the eighth player at that point to make the jump from Triple-A to the parent club in 1986. In his major-league debut, on July 12, Tarver struck out against California’s Mike Witt in his first at-bat and was somewhat taken aback by the loud ovation he received while trotting back to the bench after being retired on a 2-and-2 pitch. The Red Sox embarked on a 13-game late-July Western road trip and Tarver played center field in his first three games. He didn’t get his first hit until his third game, on July 19 in Seattle. He went 1-for-5, driving in a run and scoring a pair to help Roger Clemens to a 9-4 victory. Armas rejoined the team on July 20 but was unable to come off the disabled list for another week. That evening Tarver picked up a hit in a 9-5 loss to Seattle and then had one more hit as the Red Sox fell in Oakland, 4-2, on July 22. Once Armas returned to the lineup in early August, Tarver was sent back to Pawtucket, where he finished the season. Henderson joined the Red Sox on August 19, 1986, along with shortstop Spike Owen, for pitcher Mike Trujillo and shortstop Rey Quinones. Henderson became the regular center fielder for the stretch run and the playoffs. At the conclusion of the International League season, Tarver was called up along with pitchers Steve Crawford, Jeff Sellers, and Rob Woodward, first baseman Paul Dodson, and catcher Dave Sax as the rosters expanded for the end of the regular season. In his first game back, on September 3, Tarver came on in the ninth inning in a game at Texas to pinch-run for Mike Greenwell. Spike Owen tried to move him to second on a bunt but struck out on three pitches. Rangers reliever Dale Mohorcic began working Wade Boggs low and away, but Boggs found a pitch to his liking and slashed it to the gap in left-center. Tarver, off on the 3-and-2 pitch, never hesitated from first and came all the way around to score the eventual winning run in Boston’s fifth straight victory. For the remainder of the season, Tarver’s role on the team seemed to be exclusively as either a pinch-runner or pinch-hitter, except in for a start in left field a September 30 loss to Baltimore, after Boston had clinched the American League East. Tarver would not be with the team as it moved on to the playoffs, it had been announced on September 25 in the Boston Globe. Tarver was named to the International League All-Star team in 1986, He hit .320 in 81 games with 19 doubles, 2 triples, 2 home runs, and 31 stolen bases. When spring training in 1987 rolled around, Tarver was one of the young outfield candidates along with Benzinger, Greenwell, and Romine. However, the return of highly-touted Ellis Burks, who was coming back from shoulder surgery that caused him to miss the 1986 season, spelled the end for Tarver. Tarver began working with at-risk youth in povertystricken areas of Fresno, California, under a grant program for nearly a dozen years. He later went back to school for his business-administration degree and as of 2015 had worked for the sheriff ’s department for 15 years. He returned to Boston for the 20th-anniversary reunion of the 1986 American League champions in 2006, and the 100th anniversary of Fenway Park in 2012. As of 2015, Tarver had a 38-year-old daughter, Shontel Michelle Sumler, and four grandchildren, Kiah 18, Amira 17, Zarria 7, and newborn Suraya Sumler. He was married for the first time on May 3, 2014. While he and his wife, Debra, were engaged, in 2012, she accompanied him to Boston for the Fenway Park 100th-anniversary celebration. This article originally appeared in "The 1986 Boston Red Sox: There Was More Than Game Six" (SABR, 2016), edited by Bill Nowlin and Leslie Heaphy.